Naigra Sheet Metal Stainless Steel Submersible pump are specially designed, Years of experience, superior design and better manufacturing techniques have resulted into development of this range of pumps, which are efficient and reliable in operation. The pump range consist of many pump sizes is available with an optional number of stages to match any duty point. Bearing bush is made of anti friction rubber to withstand wear resistance. Redial flow and mixed flow impellers & bowl made from stainless steel (AISI 304 Grade). Non return Valve made in stainless steel (AISI 304 Grade). The valve casing is designed for optimum hydraulic properties to minimize the pressure loss across the valve and, thus, contributes to the high efficiency of the pump. All bearings are water- lubricated and have a square shape, enabling sand particles, if any, to leave the pump together with the pumped liquid. Stop Ring which is designed as thrust bearings limits axial movements of pump shaft. Pump motor coupling is according to NEMA standard. Suitable to 4" , 6 " & 8" Submersible Motor. Head : Maximum 440 Mtr. Head : Maximum 460 Mtr. - Normal Outlet Size : 2", 2.5" , 3" & 4"
Naigra Sheet Metal Stainless Steel Submersible pump are specially designed, with the use of latest manufacturing techniques. Years of experience, superior design and better manufacturing techniques have resulted into development of this range of pumps, which are efficient and reliable in operation. Strict quality assurance standards during the total process assure trouble free and reliability in operation requiring minimum maintenance. The pump range consist of many pump sizes is available with an optional number of stages to match any duty point. Suitable to 4” , 6 “ & 8” Submersible Motor. 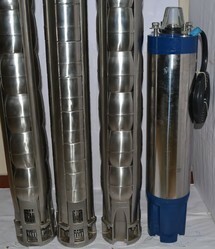 Naigra Sheet Metal NP60 Stainless Steel Submersible pump are specially designed, with the use of latest manufacturing techniques. Years of experience, superior design and better manufacturing techniques have resulted into development of this range of pumps, which are efficient and reliable in operation. Strict quality assurance standards during the total process assure trouble free and reliability in operation requiring minimum maintenance. The pump range consist of many pump sizes is available with an optional number of stages to match any duty point. Head : Maximum 336 Mtr. Naigra SP30 Series Sheet Metal Stainless Steel Submersible pump are specially designed, with the use of latest manufacturing techniques. Years of experience, superior design and better manufacturing techniques have resulted into development of this range of pumps, which are efficient and reliable in operation. Strict quality assurance standards during the total process assure trouble free and reliability in operation requiring minimum maintenance. The pump range consist of many pump sizes is available with an optional number of stages to match any duty point.